Rainbow Welcome Sign - Printable DIGITAL FILE - Personalized Rainbow Birthday Party Door Sign - Change Child's Name & Age! Welcome your guests in a MAGICAL way with this printable sign! Your design will be personalized with your child's name and age... I EDIT, YOU PRINT! The current turnaround time from receiving your order to sending you your files is 1 BUSINESS DAY (Monday-Friday, excluding holidays). ► Step 2: Select a COLOR SCHEME from the drop-down menu. ► Step 6: Your files will be sent to you within 1 BUSINESS DAY of receiving BOTH your order and your child's information. 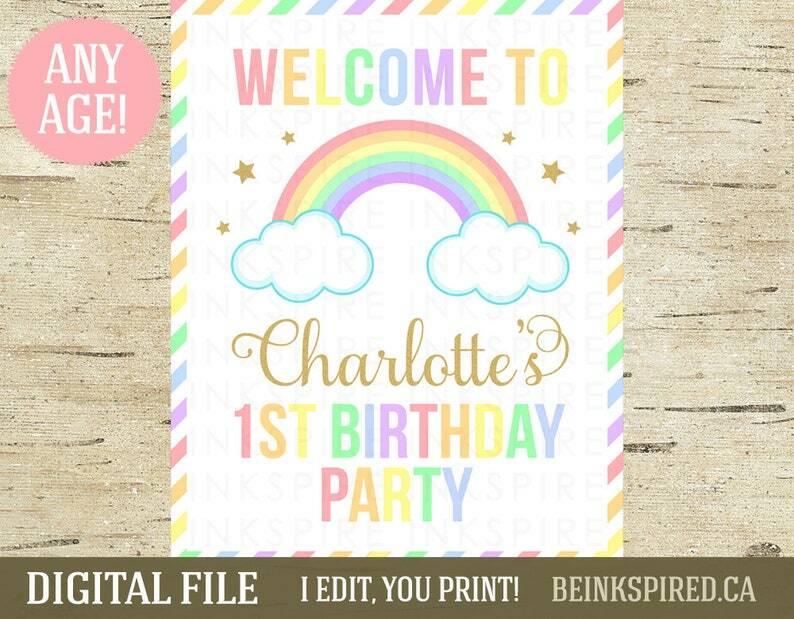 Rainbow Birthday Board - Printable DIGITAL FILE - Personalized Rainbow Birthday Party Chalkboard Sign - Other Colors Available! Any Age! Unicorn Birthday Party Cupcake Toppers - Printable DIGITAL FILE - Personalized 2" Rainbow Toppers - Change Child's Name & Age! Winter Onederland Welcome Sign - Printable DIGITAL FILE - Personalized Pink & Silver Glitter Snowflake Welcome Sign - Change the Name! New Home Gift - Printable DIGITAL FILE - Personalized Burlap Coordinates Print - Custom Longitude Latitude Sign - Change the Colors! Custom Housewarming Gift - Printable DIGITAL FILE - Personalized Coordinates Print - Custom Longitude Latitude Sign - Change the Colors! Wild One Welcome Sign - Printable DIGITAL FILE - Pink, Mint & Gold Glitter Tribal Door Sign - First Birthday Decor - Change the Name! Young, Wild and Three Sign - Printable DIGITAL FILE - Personalized Tribal Third Birthday Poster - Change the Name!